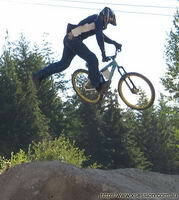 Website for all Crazy Riders of all extreme sports. Submit your link to our gallery. Send your pictures so all can see. t shirts, hats, stickers, dvds, videos, pictures, message board, links. What you see here are mostly photos taken at motocross and baja races held in the United Arab Emirates. Facilities currently exist in Dubai (Dubai Motocross Club - DMX) and Umm Al Quwain (Emirates Motorplex - UAQ). FreestyleXtreme is an official online retailer of Freestyle Motocross and Extreme Sports clothing and merchandise from top brands including Fox Racing, Alpinestars and Thor. We offer worldwide delivery. Your source for Live Freestyle Motocross Entertainment! NitroMAX FMX is a small organization based on the Northern Rivers that provides the general public free live demonstrations from top local and international freestyle motocross riders. Terra Powersports provides motorcycle racing parts, helmets & apparel, motorcycle exhausts, alarms and accessories for all types of riders.